We are currently seeking mature, personable, sea kayaking naturalist/guides for the 2019 summer season (May-September). Strong multi-day sea kayaking and water oriented background and skills. Outdoor and camping expertise that comes easily, with a passion for sharing intentional outdoor experiences. Exceptional communication and people oriented skills. Ability to multi-task with efficient organizational skills. A degree in the natural history or Outdoor/Environmental Ed. disciplines is preferred, ie Biology, Ecology, Geology, Ornithology, Outdoor Recreation, etc. Outdoor cooking experience and interest in high quality cuisine. WFR, WAFA or other advance First Aid/CPR certifications. ACA level 3 certified or equivalent experience. Experience or ability to work well with youth groups. Ability to lift 50+ pounds with no difficulty. Must be over 21+ with a clean driving record and background check. Most importantly a sense of humor, honesty and fun personality who is ready to work hard and be a part of the Moondance family! Being a valued member of a small “family” owned/operated business. Access to discounted gear through our pro-program. Use of kayaking equipment for personal use and professional development. Professional pre season guide training with world class sea kayaking instructors, as well as additional in-house instruction. Live, work, and play in a passionate outdoor oriented town – Bellingham, WA. 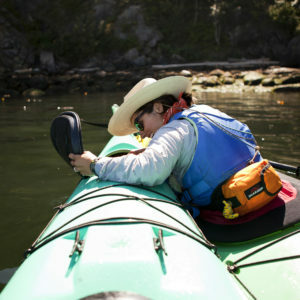 Sea kayak guide responsibilities go beyond just the water. Along with leading safe and professional experiences on the beach and in our kayaks, guides will also be responsible for occasionally driving guests to and from our various launch locations, backing up trailers at boat launches and our headquarters. Helping unload and reload kayaks safely on racks and trailers. Our team is small and you are often asked to go go above and beyond, ie, helping organize gear or food for your specific trips, keeping the shop organized and clean, washing gear after trips, etc. Sharing knowledge of the San Juan Archipelago/Salish Sea history and natural environment (including marine and forest ecology) holds high value and we hope you are just as excited to share that knowledge with our guests. Must enjoy working with a small team where you’re efforts and dedication are valued and appreciated. To maintain high trip standards, we seek qualified guides that are willing and able to make a two-year commitment. If you are interested in a position with Moondance please email owner, Kristi Kucera at info@moondancekayak.com expressing your interest along with a resume and cover letter. Application deadline March 1st, 2019.